ERA is rolling out a helpful new feature to your ERA-EMS setup that will streamline your recordkeeping by enabling you to customize which errors are flagged when importing material usages or inventory into your facility database. Please read the entirety of this update, as it contains important cautionary information. 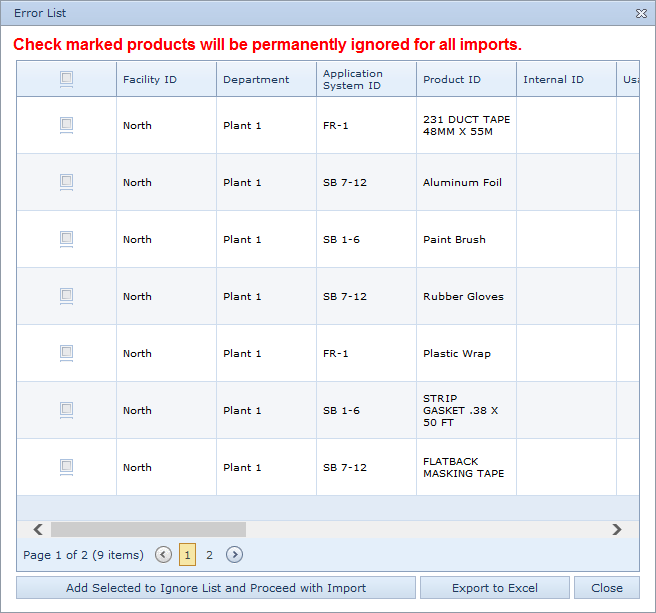 This new feature is designed for use with purchasing software outputs that often contain non-chemical materials, i.e. "gloves" "aprons", "plastic wrap", which cause the ERA-EMS to generate an error report because the item is not contained in the master chemical database. If you frequently see errors flags being generated for non-chemical items during product imports you may now choose to tell the ERA-EMS to stop creating error flags for that specific item. For example, if each month the ERA-EMS warns you that the item "gloves" could not be found in the database, you can now set those warning messages to stop appearing. ERA urges you to use caution when using this new feature. It is possible to set the ERA-EMS to ignore important error messages like incorrectly spelled chemical product IDs. Choosing to ignore these helpful types of error flags will result in inaccurate chemical databases and reports. Only choose to ignore recurring errors that you are absolutely certain are nonchemical items from purchasing program outputs like gloves, aprons, employee uniforms, etc. Never choose to ignore an error related to a chemical product, even if you believe the error to be inaccurate. When used properly, this new Error Ignore feature will save users time by reducing the amount of recurring unimportant errors that the Product Import function generates.